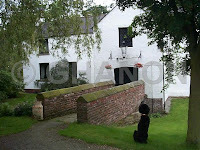 Chingle Hall is situated in the small village of Goosnargh which is on the outskirts of Preston in Lancashire. The house is one of the oldest brick building in Britain and is also reputedly one of the most haunted. Originally, the land where Chingle now stands was owned by Ughtred de Singleton from around 1066. Nothing was built on the land until 1260 when Adam de Singleton built a small moated manor house; the house (now Chingle Hall) was known as Singleton Hall. Chingle was surrounded by a moat and a small wooden drawbridge led to the front door. The wooden drawbridge was replaced by a bridge built of brick in the 16th century and since then has had many repairs but still stands to this day, some of the moat has now dried up. In 1585, the house was passed on to the Wall family who were relations to the de Singletons and in 1680 the house was extended to the west. In 1794 the house was then owned by the Farrington family for about one hundred years before the property was bought by the Longton family. In 1945, the Howarth’s then rented the house and in 1960 they bought the property. After Mr Howarth died Miss Ann Strickland moved in and when Mrs Howarth died Miss Strickland had many problems and decided to leave Chingle. The house was derelict for many years and during that time Chingle was badly damaged and vandalised until 1986 when Sandra and John Bruce bought the house and restored the building. To the right side of Chingle there is a cobbled path and in 1989, what is believed to be a well tunnelled passage was discovered. The Bruce family left Chingle around August 1994 and the house was closed to the public until February 1995 when the Kirkham's bought the property. No witnesses have been interviewed for this case as there are already scores of recorded events at Chingle Hall. The owners Judy & Trevor have kindly borrowed our group a book of overnight reports from 1996 to 1999 in which we are currently analysing and plan to produce statistics based on these reports and to archive all documentation on CD-ROM. So far, approximately 200 reports (dating from October 1996 to August 1998) have been analysed which show that the majority of incidents have been reported from the Great Hall; sounds/noises is the most common incident with the main types of sound witnessed include latches, footsteps, voices and other unspecified noises; apparitions accounted for 5% of reported incidents and are mainly reported as being outside. Kevin spent 10 overnights and 8 day visits to Chingle between August 1990 and January 1999. During this period, the following incidents were documented. August 1990 Smell of incense in Priest Room, photograph of monk-like figure appeared in nearby field, on further investigation the object was explained as being a tree stump. August 1992 Nothing significant to report. 6 Apr 1993 Photographs of burning fireplace turned out as if the fire wasn’t burning. 30 Apr 1994 Scratching noises in Priest Room, smells of incense throughout the house, minor video camera problems, sound of bolt on door moving, unspecified noise at 3am in Great Hall, footsteps and shuffling outside in nearby lane. 29 May 1995 One member felt dizzy throughout tour. 22 Jul 1995 Draught felt in upstairs corridor, smell of incense in Chapel, recorded breathing sound in Priest Room and Great Hall. 14 Aug 1995 Nothing significant to report. 6 Sep 1995 Strange indescribable feelings around midnight in Great Hall. 31 Oct 1995 Nothing significant to report. 27 May 1996 Nothing significant to report. 26 Aug 1996 One visitor claimed something had touched him on the back of his head. 21 Sep 1996 Owner’s dog jumped up in a sort of somersault way and stared at the praying niches in John Wall Room, touch to the left side of head in Great Hall, legs trembled for first 2 sessions, various raps were heard, hair stroked in Priest Room, various smells of lavender in the Great Hall, one member saw small light moving in priest hide in Priest Room, one member broke into tears. 5 Apr 1997 Latches and footsteps coming from above the Great Hall, muffled rumble whilst in the St John Wall Room, latch heard whilst in the kitchen which sounded like the door leading from the Porch to the Great Hall. 12 Jul 1997 Moving flagstone sounds in the Chapel on numerous occasions throughout the night, all present thought we heard someone settling down for the night in the Chapel but discovered nobody there or in the kitchen, loud tap in the Chapel/Porch area. 30 Aug 1997 Nothing significant to report. 26 Oct 1997 Nothing significant to report. 17 Apr 1998 Clicks & footsteps in the Chapel whilst in the Great Hall, moving flagstones heard from Chapel, smell of incense. 30 Jan 1999 Rumble & whistling sound was heard by all, footsteps followed by mumbled male voice then a sound like a chair being moved was heard by all (from upstairs), cold spots, one member saw black figure at foot of bridge outside. The first vigil consisted of 3 members of the group plus 2 non-members. Incidents witnessed included a loud distinct tap in the Chapel, one member saw a black shadow in rear window of the Great Hall which moved from left to right (blocking out the reflection of the chandelier). The other sound which was heard was a loud "chink" from the kitchen area, this was presumed to be the fridge but on investigation the sound could not be replicated. Two anomalous photographs were taken on the night, the first being taken of the front of Chingle Hall from outside. A dark image appeared outside the hall near the drawbridge and is not a leaf or similar foliage, this should have picked up the light from the flash and would be very much brighter. It is impossible to say what the image is but it is most certainly not a problem with either the camera or the film. The second of the two photographs was taken of the rear of the hall where a strange red object appeared in the window of the Great Hall, this was thoroughly analysed and turned out to be a reflection. The second vigil once again consisted of 3 members of the group and 2 non-members. During the first session, small lights were seen upon the wall in the Priest Room by one member, another witnessed a small light in the corridor leading to the John Wall Room which moved up the wall over about 15-30 seconds. This could possibly of been another member of the group on the ground floor so we tried to replicate phenomena using a torch from the ground floor and lights were cast through the floorboards and on to the wall but were much brighter and also illuminated floorboards, ceilings and other walls. The group also tried to communicate with ?spirit? in the Priest Room and 2 members noticed an unusual coldness that seemed to make the skin tingle. Other incidents included an explanation to the infamous "Chingle Chink" (see below), 1 member saw a black shadowy shape in the rear garden near the trees (human height) and some unspecified sounds were picked up on MiniDisc during one of the sessions. 19 Aug 2000 No information, details of vigil missing. 10 Feb 2001 No information, details of vigil missing. 05 Apr 2003 The last visit/vigil to Chingle Hall. Again there is no information, details of vigil missing. The "chink" in the kitchen area has been reported by many witnesses on various occasions, the group also witnessed this sound and we had an idea that the fridge was the source. We turned off the fridge for 2 minutes to see if the "chink" sound was the compressor, upon reaching behind to turn fridge back on, we discovered that the heat exchanger plate was loose and if gently rocked, the infamous "chink" was repeated time and time again. Unfortunately, Chingle Hall is now closed to the public so there are no plans to hold any investigations in the near future.